As we all know, the major drawback of the new TECHNIC Link Treads, is their tendency to slip over very smooth surfaces, like a glass or a mosaic floor. Today, jcbarros71 came up with an ingenious but at the same time very simple and effective solution, to turn around this problem. He added small regular rubber bands on alternate link treads, in order to prevent the treads to slip on those very smooth surfaces. See how it behaves on his video below, and the good results obtained! I'd prefer to see it also turning left/right, instead of just moving forward. But read that this video was from a first implementation attempt, at which just one motor of the same kind was available. The image on the right, is from a 2nd version using different motors ('M' and 'XL'), which obviously turned much more difficult to control and move straight. This one also got rubber belts in every tread, in opposition to the alternate method applied to the model on the video. Nevertheless even with this limited demonstration, it is easy to admit how beneficial and effective this solution should be, also at broaden range of movements. For the 'How to' detailed instructions, observe the image below. Fortunately the existing space between consecutive treads is enough to accommodate the rubber band in between. Otherwise it would be just a good idea, with no practical use. If the rubber bands are used in all treads, extra care in their placement have to be taken, in order to avoid the rubber bands in one tread be placed directly in font of the other. That would require that space between treads to be twice the belts thickness, which is usually not the case. So they should be suited in some sort of "V" shape, or otherwise used just at alternate treads (like on the video above). Despite the solution here presented, being made with non LEGO parts, it should be also possible to implement using LEGO rubber bands. Probably with a more neutral color combination (e.g. 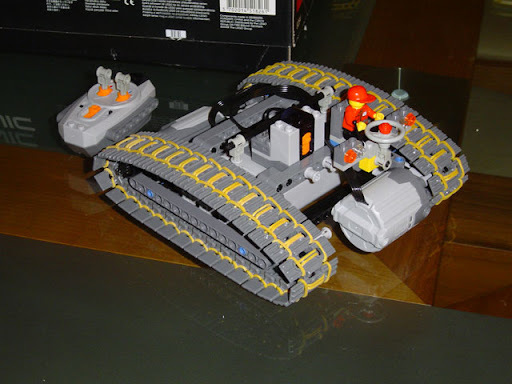 black rubber bands over the also existing black treads coming with set 7645, from Mars Mission theme). Most of tread scratches caused while running treaded vehicles on the floor, can now be also avoided with this practical idea. This constitutes a simple and very economical solution, accessible to everyone. Meanwhile J. Barros produced another video, to show how his solution performs when turning (turning a lot...). And let me say that for a glass surface, the result looks really good! That's really ingenious, indeed! Simple, elegant and effective. Plus, the yellow rubber on dark grey treads looks real nice! But, like all engineering options, it has its pros and cons... in this case, the con is turning. That's most certainly why you'd like to see it turning, and so would I. The problem with treads in general is that they must grip when moving straight, and slip when turning. That's why treaded vehicles are mostly seen on soft, muddy ground, or rocky/loose terrain. Both can be "dug" by the transversal, more or less "sharp" steel ridge(s) on each track link, while still allowing them to slide when the vehicle is rotating. Since our wives/girlfriends/mothers wouldn't find it very funny to find the expensive carpet/marble/tiles "decorated" like an asphalt road that was driven on by a 40-ton excavator, I guess rubbery or slippery LEGO treads are the two only options... ;) Choosing between them would be a matter of favouring straight or turning movement. Uploaded a new video to youtube, this time my "kind of 8294" has 2 motors (one PF-M and one PF-XL, 'cause I don't have 2 of the same type), and rubber bands on all link treads. Hope this video gives a better picture of what this implementation can do, and how the link treads behave. Very nice! I see it has no problems turning. Is the bottom of the tracks flat, or slightly convex like the top? That can also help reduce the amount of rubber friction while turning. I'd say that with 7...8 link treads touching the floor, is pretty flat, though it's natural that without the rubber bands, more 2...3 link treads could be strait and laying on the ground, rather than slightly curved and not touching it. It has to be noticed that since my implementation has assembled just the link treads and the support parts for it, instead of all the 8294 excavator, that it has not all that extra weight forcing the link treads to rest on the floor. The 8274 Bulldozer would reinforce this, as it has more link threads and weight. 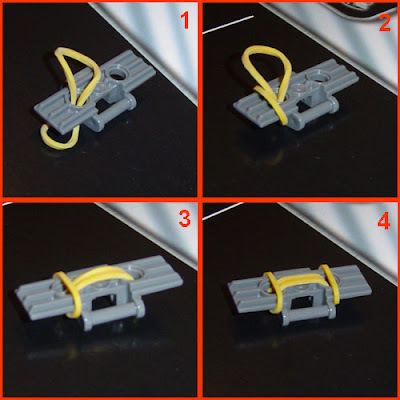 But I believe that to implement this rubber band hack, not much less link treads could be used has the 30 per track that the 8294 excavator use. saw meanwhile the 2nd video, and I'm glad to see how good it looks to perform also on curves. Updated the post meanwhile, to include also this 2nd video.